21-Oct-2010 -- I found the confluence in a plowed field on the west side of a gravel road, named County Road 9. This road runs north/south on the east line of Section 11. The field east of the road was harvested, but not yet tilled. 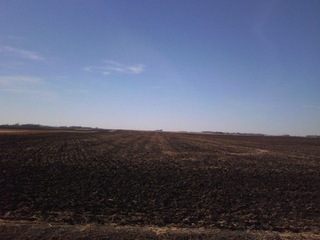 The remains of what looked like a soy bean crop covered that field. A building for raising chickens or possibly hogs stood to the southeast. It was about 60m by 40m and had hoppers for automated feeding at its northwest corner. A group of wind turbines lay to the southwest, some of them just show up in several photos. This part of the state had a good growing year with plenty of rain and sun, and then a good dry spell before harvest. Most of the harvests (corn, soy beans, and hay) are done, with the exception of some corn and hay fields. Much of the fall tillage is complete or underway. My trip to this DP was part of a combined hunt for GeoDash points and GeoVexilla (see www.gpsgames.org). I bagged three GeoDash points and two GeoVexilla in addition to this Degree Confluence.